Mark Holden Motorcycles is not an MOT station but we offer a facility whereby for the cost of £20 in addition to the MOT fee of £29.65 you can drop your bike off at our workshop where we will check that the bike complies with MOT regulations and carry our minor tasks such as bulb replacement (additional cost for parts). We will then take the bike for the MOT test and return it to the workshop for you to collect. This is ideal if you want to eliminate the chance of failing the MOT as almost everything can be checked beforehand. We are MOT testers ourselves so we know what will pass and what will not. While it's in our possession we'll also give it a look over and advise you of any non MOT related work that it may require. We've even been known to spray a bit of lube on neglected chains. Plus you can carry on with more important things like shopping or going to work. Our pass rate for those taking advantage of the Pre MOT is 100%. 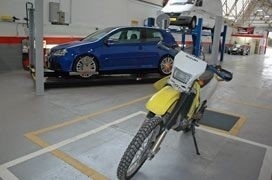 If we can't get your bike up to MOT standard we won't take your bike for the test and you therefore will not be charged the MOT fee. If additional work is required to get the bike up to MOT standard there will obviously be extra charges involved but we will discuss this with you before any work is undertaken. Please ensure you leave a contact number when you drop the bike off. We keep a MOT database for all our customers as it's surprising how many people are riding round with expired MOTs that they are blissfully unaware of. We record customers mobile numbers and text them three weeks in advance to advise them of their MOT due date. We are in the process of changing to emails instead of text messages so please feel free to email us you details here: darren@mhmotorcycles.co.uk and we'll add you to the list.